Many people mistakenly believe that all bottled water is spring water. Most bottled water, however, comes from other types of sources. The website, My Spring Water describes spring water as originating from an underground water supply that flows upward to the earth’s surface. Whether forced to the surface naturally or mechanically, spring water must originate from the primary spring location. 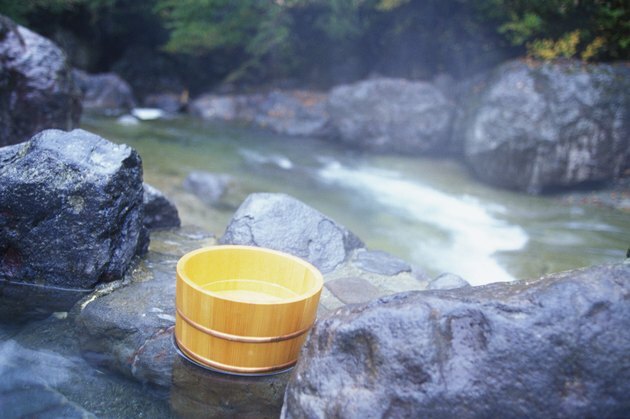 Once collected, the water should possess the same physical characteristics as water from the source spring. Bicarbonate, present in all organs and biological fluids, acts as a buffer to maintain a proper pH balance in the body. The stomach secretes bicarbonate to aid in digestion. A simple mixture of bicarbonate and water can calm stomach upset caused by excess acid production. Bicarbonate plays a key role in maintaining overall health. The Magnesium Website says bicarbonate may help prevent kidney stones and lessen fatigue in athletes. The website adds that spring waters contain varying levels of bicarbonates, from tens to hundreds of mg/L in still waters and several hundreds to thousands of mg/L in sparkling waters. Sodium, most recognizable when combined with chloride as table salt, serves to regulate water in the body. The movement of sodium between individual cells helps generate electrical signals allowing the brain to communicate with the central nervous system and muscles. A diet high in sodium can lead to elevated blood pressure in some individuals. Sodium content varies greatly between one brand of spring water and another. Clean Water for Washington recommends that people on a low salt diet check the sodium content of each brand of bottled spring water before purchasing. The human body contains more calcium than any other mineral, according to MedlinePlus, a publication of the National Institutes of Health. The largest percentage of your body’s calcium resides in bone tissue. The remaining 1 percent circulates in blood and inhabits other fluids and cells. Calcium, commonly known for bone and dental health, also assists with blood clotting, central nervous system function and muscle development. A September 2006 article in the "HSS Journal" stated that spring waters in the U.S. and Canada provide relatively low dietary calcium concentrations at an average of 21.8 mg/L. The Linus Pauling Institute at Oregon State University cites magnesium as a mineral vital to body structure and function. Approximately 60 percent of all magnesium is stored in the skeleton, nearly 27 percent in muscle and the remainder within other cells and outside cell tissue. Magnesium plays a key role in energy production, nerve signal transmission and control of muscular contractions. Most U.S. spring waters typically contain low levels of magnesium. Noah’s California Spring Water, collected from Adobe Springs, boasts a whopping 110 mg/L.